After months of taunting, sending threatening tweets, and dueling over social media, the time has finally arrived. 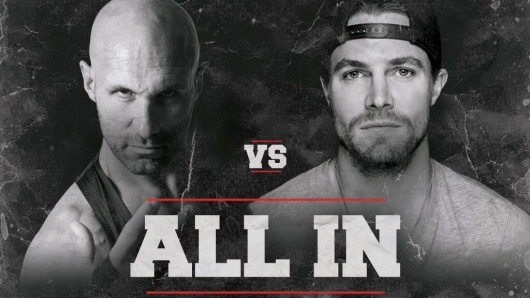 Stephen Amell, the star of The CW’s hit show Arrow, got in a WWE ring tonight for a match with his arch rival Stardust, as part of a tag team match on WWE’s mid-summer spectacular, SummerSlam. This all started when Amell, a known wrestling geek who regularly exchanges WWE title belts in his fantasy football league, attended an episode of Monday Night Raw back in May. When Stardust (Cody Rhodes, son of the late-great Hall of Famer Dusty Rhodes) got in his face, the feud was on. The two have been battling over social media ever since, and Stardust has been making cryptic comments on WWE programming about needing a “hero”. A few weeks ago, Amell had a front row seat again on Raw. After high flying wrestler Neville defeated King Wade Barrett, Stardust attacked, and got in the face of Amell, who charged the ring for a brawl, and later issued the challenge. Tonight… was the match! Check out the coverage and the tweets (including video) below. WWE’s Stardust calls out ‘Arrow’ on Smackdown! The war between WWE wrestler Stardust (Cody Rhodes) and Arrow star Stephen Amell heated up on SyFy’s Thursday Night Smackdown last night. 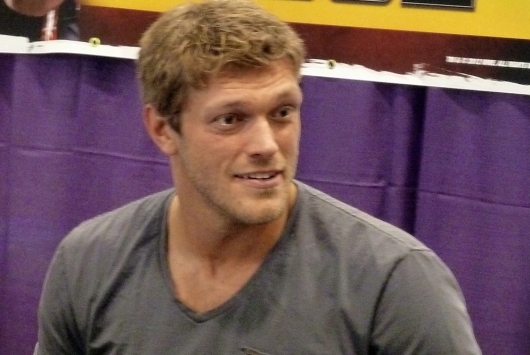 Stardust is currently having a string of matches with Neville, a high flying British wrestler who comes out wearing a cape, and who uses a top rope finishing move called the Red Arrow. 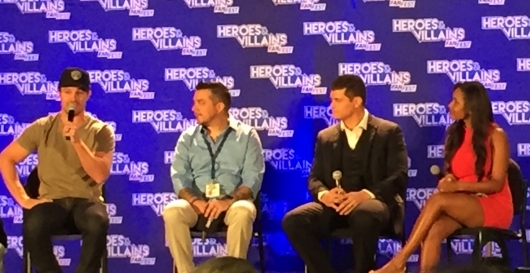 In the video, Stardust appears on the screen to distract Neville, and sends a not-so-veiled threat to Amell’s TV superhero alter-ego. Watch the video and check out the Twitter banter below. WWE’s Edge “Spears” Into ‘The Flash’ Season 2! Life is good for geeks! If you’re a joint comic book/pro wrestling geek like me, life is VERY good. News broke this week that Adam “Edge” Copeland will be joining the cast of The CW’s hit show The Flash for season 2 as Atom Smasher. This Atom Smasher will be a villain – different from his DC Comics counterpart. The character has super strength, and the ability to grow to enormous sizes. He will certainly be a match for Barry Allen (Grant Gustin). Check out some of the tweets about this and the WWE below. 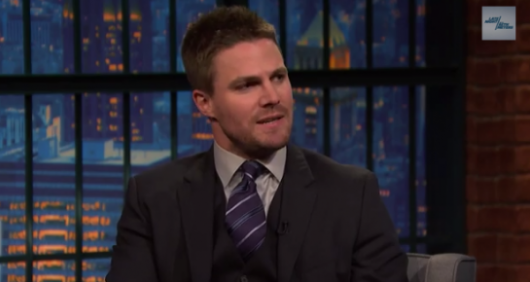 Is ‘Arrow’ Star Stephen Amell Ready to Rumble this Summer? Things have gone pretty well for Stephen Amell lately. His hit CW show Arrow just finished a successful third season, and he was cast as Casey Jones in the upcoming Teenage Mutant Ninja Turtles sequel. But a new role has presented itself… professional wrestler! On the May 25th episode of WWE’s Monday Night Raw, wrestler Stardust, a heel (bad guy) was getting into the faces of several ringside fans. One was Amell, and a twitter war has since broken out between the two.